I admit I have a problem. It’s Angora Rabbits! Over the winter me and hubs decided we would add some more animals to our little homestead. He wants the small chickens like he used to have and show when he was a kid. I on the other hand want to get an animal that I can harvest the wool for my knitted projects. He said no to getting Alpaca’s. Darn they are so cute! So I had to think of something a little smaller. Angora Rabbits! I had three Beautiful English Angora Rabbits years ago that had Blue eyes which at the time was very rare. I harvested their wool that they shed for a summer which was a tub full of zip lock bags of Amazingly soft wool to be spun up and made into yarn. We were still raising crickets at the time, so I really had little time to invest in my Angora Rabbit hobby, I ended up giving the rabbits to my neighbor kid who was going to learn to knit and spin for 4-H. 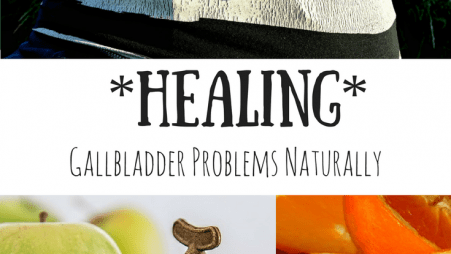 I still had those bags full of the fiber, in the top of my closet for several years until this past winter. I got the guts to try and spin some of it on my old Antique Spinning wheel. I was told by many people that it was hard to spin rabbit fiber so I never tried, even sold all most of my spinning things when times got tough, after we quit the cricket biz. But I kept the old antique wheel because I bought it while we were traveling in our RV one summer in a little cowboy town in Wyoming. Trips together were rare back in those days. It was a sentimental thing and I really loved spinning and wanted to pick it back up someday. They are small, I can have many! They won’t destroy the yard or the trees. Their wool is 7 times warmer than any wool and softer than cashmere. I can use the rabbit poo in my compost to make really nice dirt for my garden. (We have very poor dirt here). I can raise them outside in a shed or small barn. I don’t have to hire someone to come shear the wool twice a year. I have the time to take care of them and groom them each week. One rabbit will produce enough fiber each year to make a whole sweater. There hair molts like a long hair dog, 4 times a year, that’s when you harvest the wool from them. I can sell some of the wool as it is a luxury fiber and you can get $20 for a bag of their hair. Nice! I won’t have to wash the wool first, it comes off the rabbit ready to spin. Now that I picked my fiber animal it was time to go looking for one. I was on facebook and saw that a girl wanted to sell an angora rabbit on one of the farm animal groups I had been watching for silkie chickens last year. She only wanted $20 for it. SCORE! I bought my first Angora Rabbit. Now off to do more research! I joined another group on Facebook that was just about Angora Rabbits and they told me about a spinning group to join. I quickly joined that because I wanted to learn how to spin up all those bags of lushious wool I had saved up for all those years. That lead me back to the lady I first bought my rabbits from, she even fixed my spinning wheel for me all those years ago. Turns out she was the one that started a new variety of Angora Rabbits to have blue eyes. I really had no idea how famous she was at the time and now she has found me again. Must be a sign! You can read her blog here if your interested in finding out more about the Angora Rabbit, she has a wealth of information on Candy’s blog. 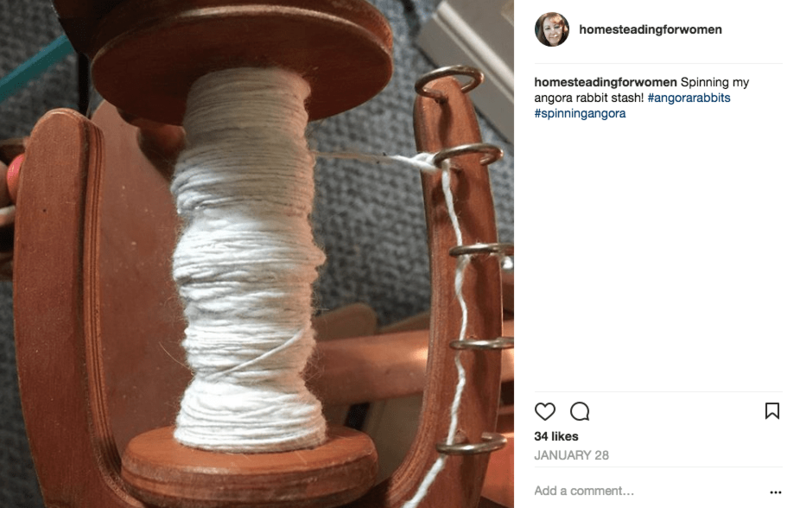 I ended up spinning all the wool I had saved and it wasn’t hard at all, even when my old spinning wheel would fall apart in the middle of spinning. I got it done, it wasn’t the nicest it could have been, I’m no pro to spinning but it was mine and I knitted it up right away, making a beautiful cowl for my step mom for her birthday. Now I wanted more rabbits, I talked to Candy about it and she found me several people to by my stock from to start my rabbitry. 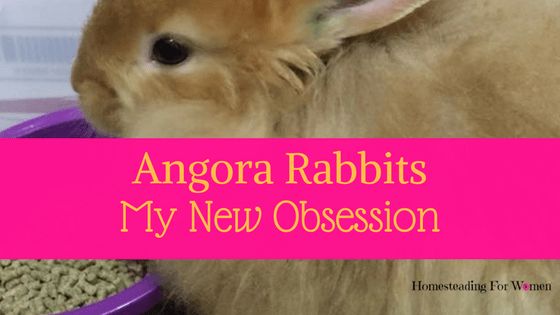 I’m buying the very best that I can to get started, with pedigrees to see what colors they are from, there seems to be a lot of colors in these Angora Rabbits. Not sure if I’ll ever get the colors straight, but with the help from others I’m sure I’ll learn fast. I found the Best Indoor Rabbit Cage EVER! I love them so much that I bought two of them! The rabbits love them too! Rusty slides under cubby hole and dig, dig, dig, then he jets out and jumps up on the top for a bite to eat or sleep. I have a litter box in there for him. I just used a cardboard box that I cut down but I’m going to buy this Jumbo Plastic Litter Pan very soon. Wait…What There’s Another Variety of Angora Rabbits called Satin?! Then I found out that there was another variety in the Angora Rabbits that I wanted to get and that was the Satin Angora Rabbits. The spinners in my facebook group love to spin this shinny fiber and I had to get one myself. (Rusty in the pictures is a Red Satin Angora Rabbit.) There are a few different types of Angora rabbits, Giant and German Angoras which is a favorite because they produce a lot more wool each year for you, like up to 4 lbs of wool per rabbit. But they are big bunnies weighing up to 11 lbs. French and Satin Angora Rabbits look a lot alike only the Satin Rabbits have a nice shine to them. I have a Chocolate French Rabbit that has more personality than some people I know and my newest member to my herd is a baby Red Satin buck, (Pictured below all laid back) he is super sweet. The Satin Angora Rabbits don’t produce as much fiber as the other Angoras, but they are much easier to take care of and the Satin’s wool is so beautiful and the most wanted wool if I was to sell any, which I won’t, I’ll want to spin it all myself. Just look how cute Rusty is! The English Angora Rabbits are the favorite, they are super cute and have the most fiber in a small body rabbit. Sometimes you can’t even see their face for all the fur. But you really have to groom them to keep the tangles out of the wool. I’m getting four of them in the next couple of weeks. I’ll be adding to my instagram on the progress of our Bunny Barn. Now I have to think of a name for my Rabbitry. Any ideas? A few years ago a close friend of mine told me a story about her mom making her own fiber to knit with. I was so naive at the time, I had no idea people still did this. Anyhow, she told me about a time that she went to a fiber arts fair with her mother and there was a booth with a woman sitting in a chair petting her angora rabbit and twisting the hairs into fiber all in one motion. Not only did her story open my eyes to other possibilities but it also kind of made me a bit obsessive about getting rabbits. Yes, my husband would like to start a rabbitry (spelling?) 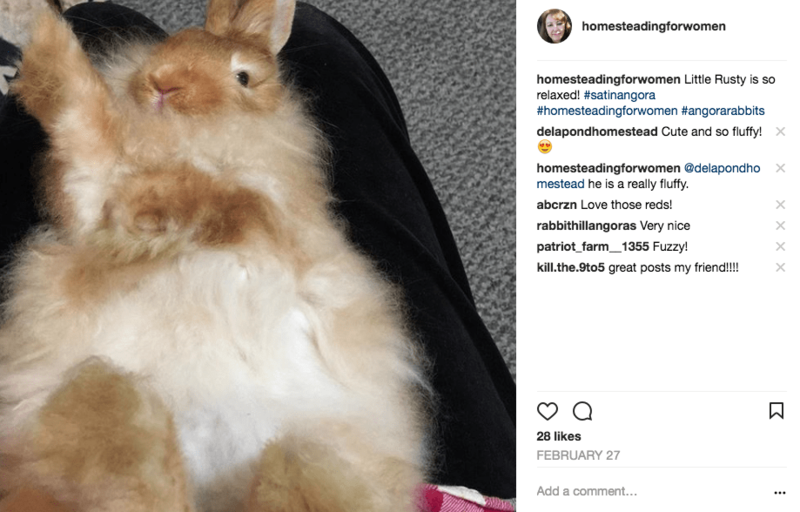 as would I for food and composting reasons, but I would really like to get a couple of angora rabbits just for the fiber as well. 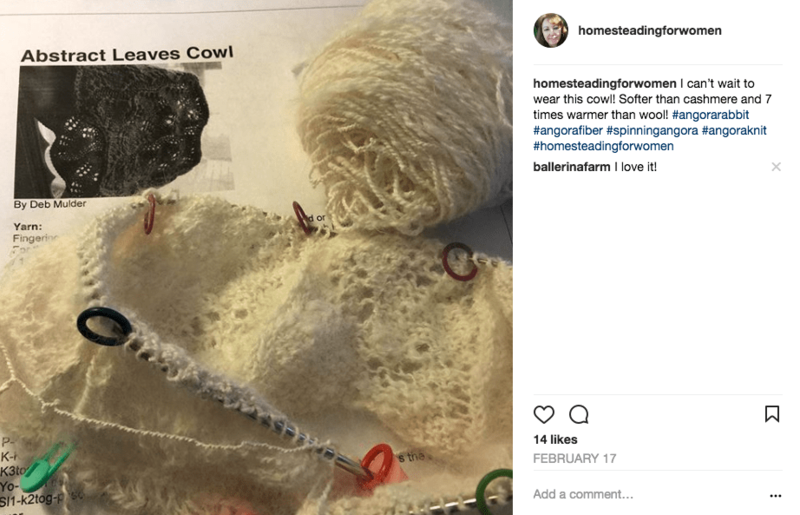 I have yet to find a fiber fair to go to but reading your blog has added fuel to my fire for rabbits sooner than later. Great post! Congrats on your new obsession and welcome to my club! I had a devil of a time finding any too, but the best thing is to get on facebook the angora spinners group is Awesome! 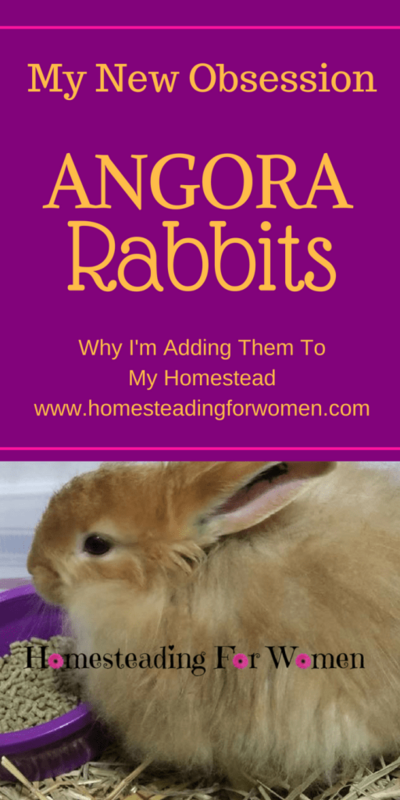 I got on there and posted that I was looking for a Angora Rabbit for spinning and in a matter of minutes I had found a long lost friend that I bought my first rabbits from years ago and such support and help finding not only one but several rabbits right in my area. I went to my first rabbit show last month and found another lady that lives down the road from me. She just called to tell me that she had three new Satin Angora Rabbit babies for me. Warning, it becomes addictive! Lol! But I just love all my rabbits. Plus everyone in my family this year will get something made with my beautiful angora yarn that I make. The best part is that I’m not great at spinning but it doesn’t matter the finished product looks and feels amazing not matter how great a spinner you are! I’ll be a big hit at Christmas this year. Keep me up to date when you find one or get in touch with me if you have any questions about anyone. Good Luck! I am so jealous ! ! !